Reform, increased pressure to demonstrate value, and bundle-based payment models are bringing significant changes to health care in general and radiology in particular. Imaging change was a recurring theme at the 2014 ACR Imaging Informatics Summit held in October. William W. Boonn, MD, a member of the ACR's Informatics Commission, a codirector of the meeting, and the president and CEO of Montage Healthcare Solutions, says the shifting landscape requires new measures of clinical, quality, and financial success. Informatics is an integral part of developing those measures. "Even though changes are being made on the policy and legislative side, the tools to achieve those changes are found in IT and informatics," Boonn says. "What a number of practices really need is the understanding and the tools to make those changes." So how can providers best utilize informatics in their practices? Boonn says the imaging value chain described by Giles W. Boland, MD, and Richard Duszak, MD, provides a good place to start. Everything from ordering—which includes clinical decision support tools—to data mining's more accurate measures can benefit from IT tools. One of the hottest topics at the summit was decision support. HR 4302, which became law on April 1, 2014, mandates the establishment of appropriate use criteria for imaging services that are "developed or endorsed by national professional medical specialty societies or other provider-led entities." The criteria will apply to "ordering professionals and furnishing professionals to imaging services furnished in a physician's office, a hospital outpatient department (including an emergency department), an ambulatory surgical center, and any other provider-led outpatient setting." The ACR has developed a number of decision support criteria and has partnered with the National Decision Support Company "to provide the technical platform, support and licensing of its copyrighted appropriateness criteria under the name ACR Select." Adding decision support to radiology reports allows radiologists to apply their clinical expertise to the ordering process for radiological examinations, says Boonn. That will help reduce unnecessary and inappropriate imaging and better optimize care delivery. He believes the legislation will help accelerate the use of appropriateness criteria, and he sees the vendor response to incorporating decision support criteria in their products as a positive step. He adds that, although the legislation represents a significant victory for radiology, it's just the beginning. The key question now is, how can radiology be actively involved in this process? "Now that there's legislation in HR 4302, that requirement is going to motivate enterprise IT and the CIOs of health systems to start moving forward," says Boonn. "I think it's very important for radiologists to understand that, if they don't continue to become proactive and become part of that conversation, the decision about implementing that system could actually happen, in many cases, without the involvement of the radiology group." To prevent that from happening, Boonn suggests that radiologists thoroughly study HR 4302 so they understand what it requires and can gauge how it will affect their practices. They also need to be actively involved in not only ensuring that the technology platform ties in with existing radiology systems but is also able to implement new technology. Otherwise, he says, organizations may be saddled with a system that doesn't adequately meet their needs. Other notable discussions at the summit included image sharing and a greater push for structured reporting. Boonn says, moving forward, radiologists will need to provide more than just free text reports. He believes adopting structured reporting can increase radiology reports' quality and value. He says there was significant buy-in on this issue from the vendors on the industry panel, which included Nuance, M*Modal, and Siemens. There was also discussion about the value of exchanging images between practices, as well as the challenges of implementing image sharing protocols. With so many vendors, sharing images among multiple systems can be extremely difficult. Boonn says the audience consensus was that, without interoperability between systems, the concept of image sharing is not likely to be as successful as it should be. Some vendors in attendance talked about image sharing as a goal, but they also voiced reservations. "[The vendors] did speak to that as a goal, but they also brought up concerns and challenges regarding who would be the owner of the data and how to actually broker those transactions," says Boonn. One possibility, which was mentioned by David S. Mendelson, MD, who is the principal investigator of RSNA's image sharing network, was that RSNA may be able to play a role in allowing better communication between vendors. No matter what type of tool a radiology practice or group needs, though, whether it be for decision support, structured reporting, or image sharing, Boonn says it's important to focus on real-world examples that work. Before adopting any technology, he says, ask plenty of questions. "IT and informatics are really driving a tremendous amount of change throughout health care, and it's affecting the way radiology is being practiced. A lot of these legislative policy or payment changes really come down to being able to use IT and informatics effectively, to be able to succeed," says Boonn. 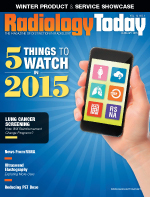 "I think radiology practices should be asking for data. We've been talking about a number of these technologies for some time, we've discussed what the value proposition is for all of these types of technologies, and from a user perspective, I would want to hear from the vendors: Show me where you've been successful, show me the use cases, and show me that you've been able to truly demonstrate this value that has been promised over the past few years."